With reference a media source in Korean, Huawei is coming out a unique smartphone design that may help propel us towards a notch-less era. The proposed new design features a small display cut-out for the camera with screen surrounding it on all sides. 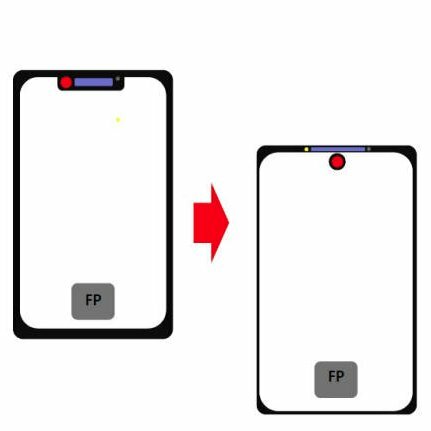 Instead of placing the front camera on the notch, the engineers intend to place it away from the top bezel as to fit in a tad more display on the front and dispose the redundant notch. Yes, it does sounds promising. However, this concept is likely to pose challenges for app developers. How will the apps behave and how will the extra screen space be utilized? Those are valid questions that need to be addressed. The design pictured from ETNews shows a very slim upper bezel that houses the earpiece, ambient and the proximity sensors. What’s more is that the report mentions a 6.39-inch LCD and a possible launch in Q4 this year. This is sync with Huawei’s roadmap which was leaked last year. It’s definitely something keep an eye out for and time will tell whether this is a winning design. At the present, vivo’s and Oppo's designs with their respective periscope-like camera on the NEX S and slide-out top on the Find X seems classier.